"I'm a New Yorker, I've lived in New York since 1968, and I was going to give this my best shot," says sculptor Alice Aycock. 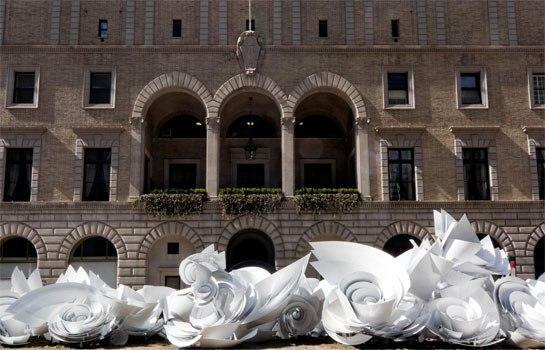 That’s a rather humble assessment of her collection of monumental, curvilinear installations, "Park Avenue Paper Chase," currently sitting atop the median on Park Avenue from 52nd Street to 66th Street—"the living room of New York City," as the artist puts it. 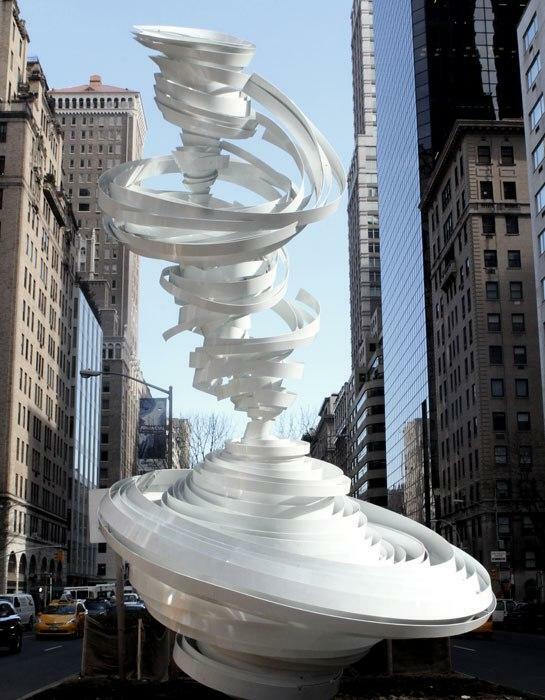 Brought to the Upper East Side by the Fund for Park Avenue, Aycock’s work comprises seven massive aluminum and fiberglass sculptures, each designed using 3-D modeling software, then formed by cutting and rolling the pieces. The resulting shapes recall everything from the swirl of runaway loose-leaf papers to cyclones to the way an Yves Saint Laurent dress moves in a breeze. One highlight is Maelstrom, which sits across from the Seagram Building. Spanning some 70 feet, it is the largest sculpture in the history of the Fund, which has previously hosted epic works by Albert Paley, Louise Nevelson, and Robert Indiana. Three years in the making, Paper Chase was an admittedly daunting commission, but for an artist who has created hundreds of major sculptures throughout her four-decade career, working on this scale was nothing new. She admits, however, to hitting a stride with this project that was a true revelation. "It effortlessly emerged as a distillation of various ideas I'd been playing with from the very beginning," she says. "It’s just one of those magical things."